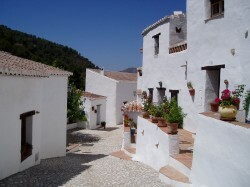 El Acebuchal, a small white town typical of southern Spain, lost in the middle of the mountains yet close to the coast. The perfect place to disconnect and relax surrounded by nature. The Acebuchal is a picturesque village in the foothills of the Sierras Tejeda and Alhama Almijara Natural in Málaga, and it is the perfect place to have a relaxing time and escape from the routine. It really shows the typical Andalusian style with white houses and narrow roads surrounded by flowers and offering a beautiful natural landscape. Cobblestone streets, white houses, gardens full of flowers and the relaxing sounds of nature are few of the wonders you can enjoy by visiting this great place. The Guardia Civil evicted Acebuchal in the summer of 1948. The 200 residents of the village had just enough time to run away, leaving behind their belongings, their homes and their lives. The authorities suspected that the Maquis dictatorship was supported from The Acebuchal, was an area that favored refuge of the men of anti-Franco guerrilla until 1951, when the Communist Party abandoned it. The Acebuchal paid the price of being the point where the fire between the Maquis and the Civil Guard converged. Years later, one of the oldest family owner of few of the houses of this town, started rebuilding it and gained control over their houses and made Acebuchal a beautiful place to visit now. There are plenty of different types of activities that can be done, from a calmed walk to quad biking, either way, you will get the most spectacular views. The town offers multiple opportunities for outdoors sports such as hiking, mountain biking, horse riding and quad biking among other possibilities. If you are a beach lover and enjoy sunbathing or swimming in the sea, the Costa del Sol and Costa Tropical are just few minutes away from the town and you will be able to enjoy the beautiful beaches of Nerja, Maro, La Herradura and Almuñecar, all of them within 30 minutes drive. The crystal clear waters of this part of the Mediterranean are famous for diving and snorkeling. There is a very famous restaurant in the town called Bar El Acebuchal where you can taste delicious dishes made with organic and natural ingredients and cooked in a traditional way. All the meals are cooked in a traditional way and you can enjoy a variety of salads, meats and the best homemade desserts. If you fancy exploring other places of Andalusia, El Acebuchal is a good starting point as it is a few minutes away from the famous town of Frigiliana where besides wandering through its beautiful streets you will find many bars and typical restaurants, as well as supermarkets and souvenirs stores. All of this makes this little town the perfect place to combine adventure, culture and nature. It is ideal for all type of breaks, from daytrips to weekend getaways to disconnect and unwind from the daily routine and the city life spending few days holidaying and relaxing.